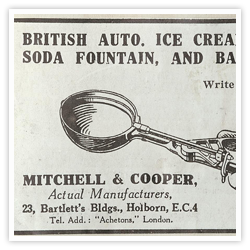 Known today as a manufacturer and supplier of catering and bar equipment, Mitchell & Cooper started life as engravers and silversmiths in the Farringdon Road, London in 1879. 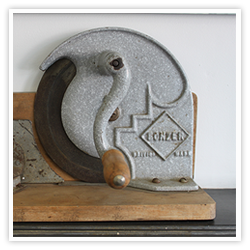 Since then, Alfred Mitchell and Arthur Cooper's enterprise has evolved continuously to become a leading manufacturer of can openers, food portioners, spirit dispensers, bar accessories and cup dispensers, carrying the renowned "Bonzer" trademark. The company has successfully complemented this range with products from carefully selected overseas producers, including market leading US, French and Italian companies. The present Managing Director, Guy Cooper, great grandson of founder Arthur Cooper, ensures that the company and its products continue to move forward to maintain their position as a respected supplier to the catering and allied industries. Mitchell & Cooper established at 1 Northampton Street, Clerkenwell just off the Essex Road. Advertised as heraldic, monogram, inscription and general engravers to the trade. One year after the company was founded it become a sole practice after the death of Alfred Mitchell. 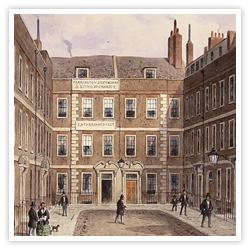 The company then moved to 58 Great Sutton Street, Clerkenwell, EC in 1890. Following the death of Arthur William Cooper in 1900 the company continued under the same style by Caroline Louisa Cooper who was subsequently joined in partnership by Arther John Cooper and Sidney Walter Cooper. In 1909 Mitchell & Cooper advertised as engravers, enamellers and manufacturers of exclusive novelties such as Empire menu holders in silver and enamel. 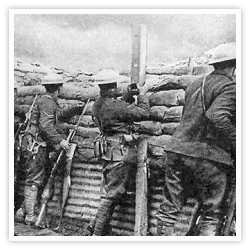 The government of the day acquisitioned the factory in 1914 to assist with the war effort. Mitchell & Cooper produced trench periscopes and aircraft parts. In 1919 the firm moved to 23 Bartlett's Buildings, Holborn Circus, EC1. In 1927 the Bonzer brand name was registered. 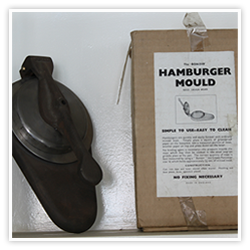 The company branched out into the manufacture of catering equipment and in the 1920’s producing the first commercial British Ice Cream Portioner. It was during a particular chance meeting with an Austrailian in London who took a liking to the British Ice Cream Portioner that Bonzer® was born as he exclaimed “Crikey, that’s a Bonzer Product! !” Arthur Cooper sold the company but never received the money and the family lost everything. He started again! The 1930's saw the introduction of the now world famous Bonzer Can Opener. 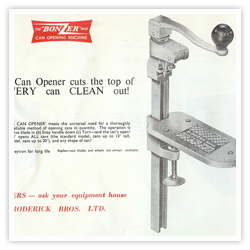 The can opener has seen several developments over the years and has won several awards and still today the range remains core to the business's success and reputation for quality. The 1930's also saw Bonzer design and manufacture other products such as a cork puller for Gaskell and Chambers and a milk/beer pump called Bonzeril Hygenic Pump Dispenser. Bonzer manufactured bread slicers for the Ministry of Defence. Production of beer/milk pumps continued. During the Blitz East London was hit hard and the Mitchell & Cooper factory at the time was destroyed by a bomb, nothing was left apart from the safe. 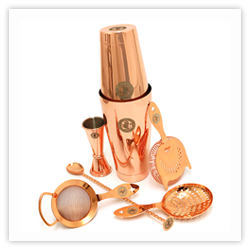 The 1940's saw the introduction of Straw Dispensers, Wafer Servers, Transfer Ladles and Ice Picks. 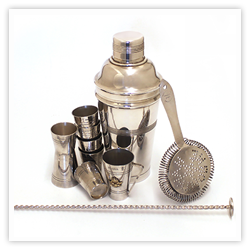 Back Bar products and additional ice cream items where developed, cocktail shakers, strainers, bottle pourers and beer engines for WR Loftus. A larger can opener platform was developed for the new large ham tins. Repairs and after sales service set up as there was a shortage of raw materials at the time. In 1958 the company moved out of London to 241 Broadway, Bexleyheath, Kent. William Antony Cooper (Tony) father of current Managing Director and Projects Director joins the company after leaving the Air Force. 1959 Cherry Lemon / Appetiser stand introduced. Introduction of Napkin and Cup Dispensers, Corn Cob Holders, Appetiser Dispenser, Hamburger Mould and hard boiled egg dispenser. Tony Cooper designs Unigrip Portioner using a radical approach to design and material use, this design is still fundimental to the current range which is used today by global QSR's for consistant portion sizes. Barboard, Hawthorne Strainer, Silver mixing spoon, thimble measures introduced. Company starts to export product to Europe. The company added to the popular portioner range with the Litegrip model which today remains one of the company's best selling products. 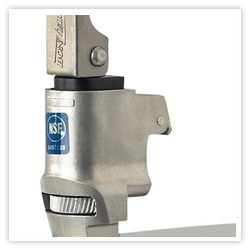 Can Opener range moves away from cast iron to mild steel and plastic handle. Export sales expand to the Far East. Mitchell & Cooper is incorporated. 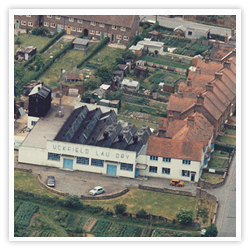 The company moves from Bexleyheath in Kent to Uckfield East Sussex buying the Old Laundry. The company is still at this premises today. The 1980's saw a major change to Mitchell & Cooper's strategy with the introduction of other manufacturers products. The first brand of products to be imported was from French manufacturer Dynamic followed by US brand San Jamar in 1986. 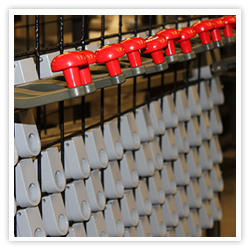 Manufacturing capabilities increase with the introduction of In-house polishing and painting. Acquisition of Averly Measures and Spirit Company. The '90s saw further additions of bar products with the acquisition of JTS and the introduction of spirit measures under the brand name Eclipse. The evolvement of traded products continued with the introduction of Matfer/Bourgeat and Zeroll Ice Cream Scoops. ISO 9000 certification awarded in 1993. Can Openers and Unigrip Portioner certified hygienic by NSF for USA market. Acquisition of Diamond Dispensers. Awarded self varification of spirit dispensers and thimble measures by Weights and Measures Laboratories. Bonzer EZ-3 Can Opener (now EZ-20) wins The Caterer Product Excellence Award. Point of Sale division formed to offer bespoke product design and branding for the drinks industry. Awarded Disabled Employers Kite Mark. Guy Cooper (current MD) joins the business. The company celebrates 125 years of business in 2004. 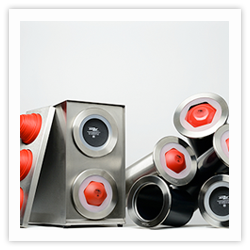 Since 2010 the company has invested in new machinery to ensure the majority of production is still produced in the UK. Investments in IT have also been made throughout the course of the last seven years, keeping upto date with latest developments in ERP and web technologies to provide excellent customer service for our growing customer base. 2010 saw the new range of Bonzer Cup & Lid Dispensers added to the product portfolio and in 2015 saw a new range of Barware designed and produced by M&C, The Heritage Range. In 2015 M&C become exclusive distributors of Nemox Gelato machines in the UK, the Nemox 4K Touch won The Caterers Product Excellence Award in 2016.